Kevin Roderick is a journalist, editor, blogger and author living in Los Angeles. He is the creator and publisher of LA Observed, a widely cited news website that Forbes rated as Best of the Web. He is a Contributing Writer on politics and media at Los Angeles magazine, an award-winning radio commentator, and is often asked by the media to talk about Southern California issues. In addition to Los Angeles, Kevin's magazine reporting has appeared in Smithsonian, Los Angeles Times Magazine, The Industry Standard, C, L.A. Architect and the Jewish Journal of Greater Los Angeles. His latest book, Wilshire Boulevard: Grand Concourse of Los Angeles, was a Los Angeles Times bestseller and Editor's Choice, as well as a finalist for the Southern California Book Award. It is currently in its third printing from Angel City Press. Visit the Books page for details. Kevin launched LA Observed as a part-time blog in May 2003. The site has grown into a respected source of news and observations that is frequently picked up in the mainstream media and on blogs. An LA Observed commentary airs weekly on KCRW-FM, the National Public Radio station in Santa Monica. The Radio-Television News Association of Southern California recognized the segment with a Golden Mike award. Kevin has appeared often in the media and has spoken on numerous panels and at conferences, including at the Graduate School of Journalism at Berkeley, USC Annenberg School for Communications, UCLA Extension, University of Florida, Norman Lear Center, California State University Northridge, Glendale College, League of Women Voters and Los Angeles History Conference. 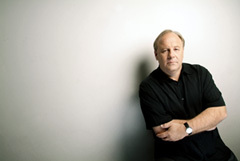 He has served as a moderator, interviewer and panelist at the Los Angeles Times Festival of Books. A journalist for more than 25 years, Kevin has judged awards for PEN Center, Associated Press and the Online News Association. Kevin was a senior editor and staff writer at the Los Angeles Times for two decades, overseeing the paper's top projects and reporting on politics, urban affairs, the environment and rural California. He shared in two Pulitzer Prizes awarded to the staff for local news coverage. He also was Los Angeles bureau chief for The Industry Standard, a weekly business news magazine. Currently, he is director of the UCLA Newsroom at the University of California, Los Angeles.